Capital’s fourth-ever Kids Kamp will be hosted by the Office of Student and Community Engagement on Nov. 3 from 9 a.m. to 1 p.m.
“Capital University partners with First English Lutheran Church (FELC) to host Kids Kamp once a semester,” Abbey Rutschilling, the program coordinator for the SCE, said in an email. Kids Kamp provides an opportunity for children from a nearby area to catch a glimpse into what could be their future in terms of college. The event is organized by interns Jack Spiller and Kelsey Mitchell, who also work on events such as the Smile! Series, Crusader Day of Service, and the annual tree lighting. “Before the event, Jack and Kelsey plan the activities and logistics while [I provide] additional support as needed. During Kids Kamp, the SCE team, with the help of student volunteers, lead the morning’s activities and engage with the children from First English Lutheran Church,” Rutschilling said. 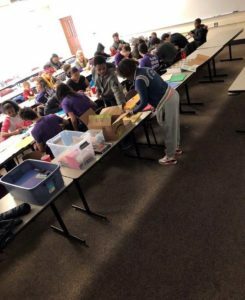 “Kids Kamp stems from the Saturday programming FELC already provides for the kids at their church in the Near East Side community. Building off an already existing partnership, Capital and the SCE team wanted to bring Capital students and kids attending this Saturday program together,” she said. During Kids Kamp, children are able to play in the Cap Center, work on a service project, make a craft, and get lunch in the MDR. The goal of the event is to bring the opportunity for children from FELC to start thinking about a college experience and encourage them to reach their goals. The SCE hopes to interact with the kids and show them the possibilities and support that they have from the mentors at FELC and at Capital. “Kids Kamp is all about offering mentorship to the children and showing them, through our care and conversation, the possibilities they have to succeed,” Rutschilling said. Kids Kamp also helps student volunteers and the visiting children from the church build a relationship with each other in a fun, community-building environment. Students interested in getting involved can sign up by filling out a form here.